The investment grade credit markets are barreling toward year-to-date tights as the week comes to a close. 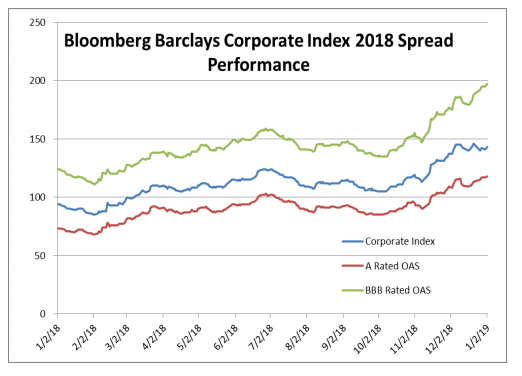 The OAS on the corporate index closed at 121 at the end of February, which marks a new low for spreads in 2019. Risk assets continue to perform well even as Treasuries have inched higher. The 10yr Treasury is 9 basis points higher as we go to print and sits just a few basis points lower than the 2019 high water mark. In what seems to be a recurring them, it was yet another solid week of issuance as companies raised nearly $25bln in new debt during the last week of the month. Concessions on new issuance remain thin as most order books are well oversubscribed to the tune of 3-5x deal sizes. $98.21bln of new corporate debt was priced during the month of February, bringing the YTD total to $202.573bln. According to Wells Fargo, IG fund flows during the week of February 21-February 27 were +$5.6 billion. This brings YTD IG fund flows to +$35.345bln. Flows at this point in the year are modestly outpacing 2018 numbers. Fund Flows & Issuance: According to a Wells Fargo report, flows week to date were $0.6 billion and year to date flows stand at $10.7 billion. New issuance for the week was $2.1 billion and year to date HY is at $29.1 billion, which is -12% over the same period last year. S. junk bond spreads and yields were resilient amid wavering stocks as oil prices held steady and funds reported more cash inflows. Spreads continued to tighten after falling below 400 basis points for the first time since mid-November and yields were flat to little changed. The investment grade credit markets look to end the week on a positive tone, but spreads are largely unchanged for the third consecutive week. The OAS on the index closed at 125 on February 4th and has traded within just a 2 basis point range since then and most of that time was spent within a 1 basis point range. The OAS on the index was 125 at the market close on February 21st and we remain wrapped around that number as we go to print this morning. It was another solid week of issuance as companies raised over $25bln in new debt during the holiday shortened week. Investor demand for new deals remains very strong and concessions on new debt have continued to grind lower. As far as basis points go, mid-single digit new issue concessions are the name of the game in the current environment. Over $73bln in new bonds has come to market in February and the YTD total is now $178bln. According to Wells Fargo, IG fund flows during the week of February 14-February 20 were +$1.6 billion. This is a more modest pace of flows compared to prior weeks and it brings YTD IG fund flows to +$30bln. Flows at this point in the year are modestly outpacing 2018 numbers by the tune of 2%. A Blurb about BBB’s – CAM is significantly structurally underweight and quite cautious when it comes to BBB credit. However, we can pick and choose the credits that we would like to own so we are not nearly as worried as some market commentators and those in the financial press seem to be with regard to the growth of the BBB portion of the index. 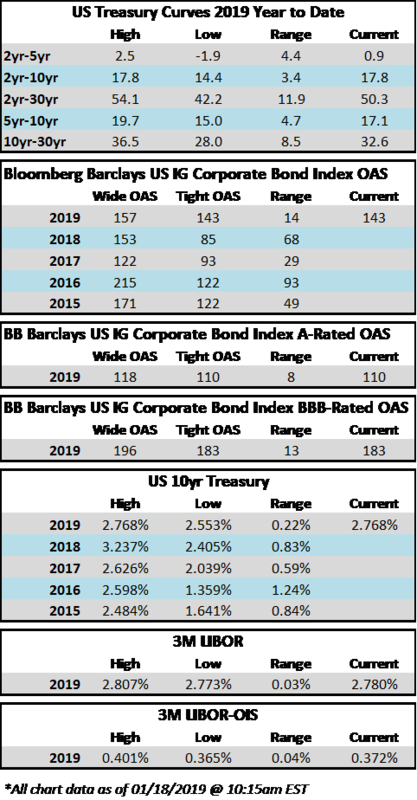 Here are a few interesting recent developments that show that not all the growth in BBB credit should be viewed as negative and that there are some very large BBB-rated issuers who may become A-rated in the near term. HCA 1st lien debt was upgraded to investment grade by Moody’s in January. HCA was previously the single largest issuer in the high yield index. As a result of receiving its second BBB-rating, $13.2bln of HCA debt moved from junk to investment grade with low-BBB ratings. Also in January, payment processor Fiserv, Inc. announced that it would be acquiring First Data. Junk rated First Data is one of the 50 largest issuers in the high yield index. The deal is structured in a manner so that Fiserv will retain its mid-BBB investment grade ratings. Fiserv plans to re-finance $5.31bln of junk rated debt – and the new debt will be BBB rated. 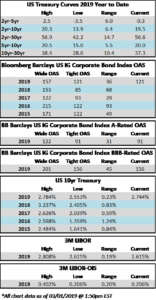 The NewCo will have more BBB debt, but it is largely the result of refinancing junk rated debt while creating a larger company with more scale, better growth prospects and greater free cash flow generation. On February 21st, Verizon held an investor day. Verizon has been actively paying down debt in recent quarters and its CFO highlighted this when talking about its capital allocation plans. Verizon already has an A- rating at Fitch and it is high-BBB at both Moody’s and S&P so it needs only one of them to upgrade it to single-A before it is “officially” an A-rated credit. An upgrade is a distinct possibility if the company remains on a deleveraging path. Verizon is the second largest BBB-rated bond issuer in the corporate index and an upgrade would result in over $73bln of index eligible debt leaving the BBB-rated portion of the index and entering the A-rated portion. Bottom line, headlines about BBB-rated credit are just that –to get the real story one must dig into the details. CAM NOTE: This is yet another example of a highly levered BBB-rated company impairing shareholders in order to pay down debt. It is our view that equity holders are the ones most at risk when it comes to BBB-rated credit, as bond holders have priority in the capital structure waterfall. CAM has no exposure to Kraft Heinz. Kraft Heinz Co.’s “disastrous” earnings announcement prompted analysts to question the packaged-food giant’s growth prospects and its capacity to move ahead with plans for a significant acquisition. The shares plummeted as much as 28 percent to $34.70. Kraft’s plunge erased about $16 billion in market value. For perspective, that’s more than the entire value of packaged-food peers JM Smucker Co. or Campbell Soup Co.
Analysts at Goldman Sachs, Barclays, JPMorgan, Stifel, Piper Jaffray, Barclays and UBS cut their ratings on the stock following what Stifel described as a “barrage of bad news:” Quarterly profit missed estimates, the outlook for 2019 was disappointing, and Kraft Heinz cut its dividend, lowered profit-margin expectations and took a $15.4 billion writedown on key brands. Investment grade spreads tightened modestly throughout the first half of the week before a deluge of new issue supply led the market to take a breather on Thursday. While the tone is positive on Friday morning, the corporate index looks like it will finished the week relatively close to unchanged. The real story this week was the aforementioned new issue supply. Over $38bln of new debt priced in just three trading days, through Wednesday while no deals priced on Thursday or Friday. Altria led the way this week as it priced $11.5bln on Tuesday and then AT&T came with $5bln on Wednesday. 3M Co, Goldman Sachs, Boeing and Tyson Foods were among the other companies that printed multi-billion dollar deals during the week. According to Wells Fargo, IG fund flows during the week of February 7-February 13 were +$2.9 billion. This brings YTD fund flows to +$13.312bln. As far as new supply is concerned, monthly volume projections for February are still calling for ~$90bln of issuance during the month. As we roll past the mid-month mark, we have seen just over $48bln in new supply. Fund Flows & Issuance: According to a Wells Fargo report, flows week to date were $0.3 billion and year to date flows stand at $8.6 billion. New issuance for the week was $7.2 billion and year to date HY is at $26.9 billion, which is -10% over the same period last year. Yields on U.S. speculative-grade bonds are set to decline for the fifth week, even as the rally was tempered a bit on Thursday. Fund managers, meanwhile, had their straight week of inflows. Need more proof that investor appetite for risk-taking is returning in the U.S. junk-bond market? Take a look at the debt being offering by Ascend Learning, the educational software maker acquired two years ago by Blackstone Group and the Canada Pension Plan Investment Board in a leveraged buyout. It’s just the latest sign that investors have returned to the market with a vengeance after fleeing for safer asset classes at the end of 2018. At-the-money implied volatility in the $14.9 billion iShares iBoxx High Yield Corporate Bond ETF has more than halved since the December maelstrom and now sits below historic averages. While a resurgence in risk appetite and benign technical have powered a 4.9 percent return this year alone, the rally’s staying power is in question. T-Mobile US Chief Executive Officer John Legere says his company doesn’t use equipment from Huawei Technologies Co., and won’t after buying Sprint Corp. to form a bigger No. 3 in the U.S. wireless market. “Let me be clear—we do not use Huawei or ZTE network equipment in any area of our network. Period. And we will never use it in our 5G network,” Legere said in written testimony prepared for a hearing Wednesday before the House communications subcommittee. Sprint parent SoftBank Group has “significant ties” to Huawei, as does T-Mobile parent Deutsche Telekom AG, according to Carri Bennet, general counsel for the Rural Wireless Association that represents smaller competitors to the merging parties. It was another strong week for IG credit. The OAS on the Bloomberg Barclays Corporate Index opened the week at 147 and tightened to 143 through the close on Thursday evening. The tone remains positive in the market this Friday morning as the 2019 risk rally continues. The OAS on the index finished 2018 at 153 and closed as wide as 157 on January 3rd, during the first holiday shortened week of 2019. Since January 3rd, the spread on the corporate index has closed tighter 8 of the last 10 trading days, moving from 157 to 143. For historical context, the three and five year average OAS for the index is 124 and 126, respectively, while the average since OAS since 1988 inception is 134. According to Wells Fargo, IG fund flows during the week of January 10-January 16 were +$547mm. Per Wells data, YTD fund flows stand at +$2.7 billion. To recap 2018’s action, flows during the month of December were the second largest notional outflow on record at -$26bln and the largest since June of 2013 when -$27.4bln flowed from IG funds. The primary market is alive and well, as $25.65bln in corporate bonds were printed during the week. According to data compiled by Bloomberg, borrowers are paying less than 5bps in new issue concession, down from as much as 25bps at the beginning of the year. Narrowing concessions support the thesis that the market is wide open and investor demand is robust. Corporate issuance in the month of January has now topped $77bln.